The exhibition "Rendering Borders" is an encounter between the Iranian artist Morehshin Allahyari and the Israeli artist and scholar Lior Zalmanson. In the course of the exhibition period, life-size parts of Allahyari’s body will be printed by means of a 3-D printer, since she is not able to physically enter Israel. 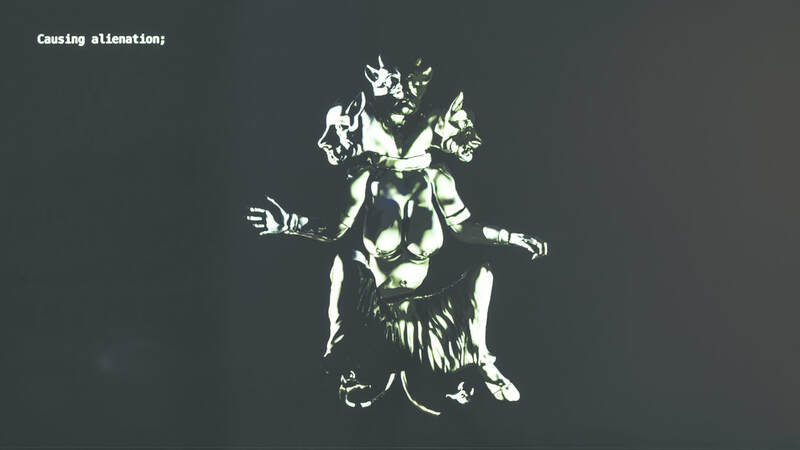 The project will unfold simultaneously in different spheres, thus challenging accepted definitions of time and space as well as of exhibition practices: Different parts of Allahyari's body will be scanned in New York using a 3-D scanner, and will be modeled on a 3-D design program in a pose characteristic of the Persian goddess Ishtar. The files will then be sent online to a printer located in the Artists' Studios gallery in Jerusalem. Over the course of the exhibition period, the printer, operated by TechFactoryPlus, will print out all of the body parts, so that Allahyari's presence in the physical space of the gallery will be "manifested." Visitors to the exhibition will be invited to take a test that is an absurd and poetic take on recruiting tests for elite security or intelligence forces. Those who successfully pass the test will become "agents" in the service of Allahyari, and will each receive a part of her body that they will be asked to document in a site embedded with personal, emotional, or national meaning. The documentation will be posted online in real time, so that Allahyari may follow her body parts and their journey. The agents will all come together for a ceremony dedicated to the reassembly of the body, which will take place prior to the closing of the exhibition. This new collaborative project by Allahyari and Zalmanson explores boundaries and their rupture in the digital age. The artists undermine the geo-physical and political boundaries of the exhibition space as they make Allahyari present in it, even though she cannot physically visit Jerusalem. This process explores the possibility of healing and restoration by digital means, in contrast to the destructive viruses that are spread online. Zalmanson and Allahyari's joint project casts an ironic gaze at power relations, with Zalmanson playing the role of a "big brother" who controls the movement of Allahyari's body in space. Yet the non-Western female body is transformed, in this work, into a subversive object-subject endowed with unexpected powers, which may rebel against the intentions of its white male creator. In addition to the new collaboration, the exhibition will feature Allahyari’s project "She Who Sees the Unknown," in which she studies dark goddesses, monsters, and female jinns originating in the Middle East. Here too, she uses 3-D printers and scanners as part of her long-term engagement with imaging as an activist and feminist tool. This project explores the symbolic meaning of cultures and myths, as well as the effects of colonialism and other forms of contemporary oppression. The poetic narrative moves between truth and fiction, between the speculative and the historical, between sorcery and magic and logic and technology. ​Allahyari and Zalmanson met online over two years ago, as part of a project by the artist Nadav Assor that was featured in the exhibition "2048 – Voice over," at the Manofim Contemporary Art Festival in Jerusalem (2015, curators: Maayan Sheleff, Rinat Edelstein, Lee He Shulov). Assor brought together people who could not be present in Jerusalem for a variety of reasons, including their national identity. These participants, which included Allahyari, engaged in virtual conversations. Allahyari and Zalmanson were “matched” to engage in such a dialogue, and elicited a sense of mutual interest. They have continued to meet over the past two years both virtually and physically. Lior Zalmanson (PhD) studies the digital sphere through a range of mediums and practices. He is a faculty member in the information and knowledge management department at the University of Haifa, where his research centers on the study of human behavior in virtual technological environments. Zalmanson is also the director of the Print Screen Digital Arts and Culture Festival. As an artist, he studies the way in which the Internet is capable of challenging physical and political limits. In his earlier work Listening to the Enemy (with Eran Hadas, 2015), he created an alternative audio guide to the department of archeology at the Israel Museum, Jerusalem: over the course of a single evening, visitors could use an online application to listen to discussions of the works by people who could not physically visit the museum because of their affiliation with "enemy countries." This exhibition has been made possible thanks to the generous support of TechFactoryPlus, and Upfor Gallery. معرض "ترسيم حدود " هو لقاء بين الفنانة الإيرانية مورشين اللهياري والفنان الإسرائيلي والباحث ليئور زلمانسون. من بين مشاريعها السابقة "مادة مظلمة"
ما الذي يمكن فعله بطباعة ثلاثية الأبعاد؟" - حول البلاستيك"
מה אפשר לעשות עם הדפסת תלת מימד?" - על"